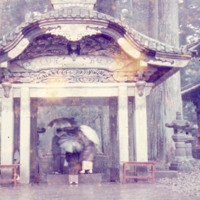 Shinto and Buddhism are Japan's two major religions. 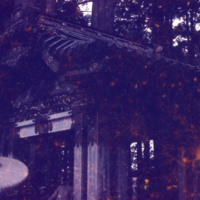 Shinto is as old as the Japanese culture, while Buddhism was imported from the mainland in the 6th century. Since then, the two religions have been co-existing relatively harmoniously and have even complemented each other to a certain degree. 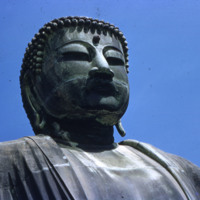 Most Japanese consider themselves Buddhist, Shintoist or both. According to surveys carried out in 2006 and 2008, less than 40% of the population of Japan identifies with an organized religion: around 35% are Buddhists, 3% to 4% are members of Shinto sects and religions derived from Shinto, and from less than 1% to maybe 2.3% are Christians. Confucianism also has a place in Japanese culture. However when a Gallup poll asked about atheism, it discovered that 31% of Japanese people checked the ‘convinced atheist’ box. If the phrase ‘religiously unaffiliated’ was used instead of ‘atheist’, the yes-result was 57%. Certainly one of the big problems with saying that the Japanese are ‘atheist’ is that atheism requires there to be a ‘god’ to not believe in. Instead, Japanese religions are somewhat unclear on the matter of whether there are gods or spirits or one central deity or something else entirely. According to Ian Reader, a professor of Religious Studies at Lancaster University, “Much of what is done at New Year and the bon festival does not require any prior or fixed religious commitment from the participants.The gods and Buddhas are seen as being supportive and one can pray to them without being obliged to join a religious organization. Or indeed without needing to declare belief in their existence.” The term 'religion' in Japanese culture defines only organized religions (that is, religions with specific doctrines and required membership). People who identify as 'non-religious' in surveys actually mean that they do not belong to any religious organization, even though they may take part in Shinto rituals and worship. Scholars Isomae Jun'ichi and Jason Ānanda Josephson have challenged the usefulness of the term 'religion' in regard to Japanese 'traditions.' They have shown that the Japanese term and concept of 'religion' (shūkyō) is an invention of the 19th century. Religion does not play a big role in the everyday life of most Japanese people today. The average person typically follows the religious rituals at ceremonies like birth, weddings and funerals, may visit a shrine or temple on New Year and participates at local festivals. After all, as the old saying goes a Japanese person is born to Shinto rites, married with Christian rites, and buried with Buddhist ones. 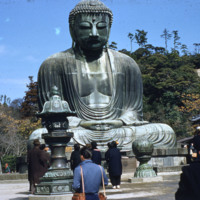 People stand in front of the great Buddha at Kamakura (the Kamakura Daibutsu). The Kamakura Daibutsu is in Kamakura at the Kōtoku-in temple. A line of people in yellow robes march through a gravel lot. 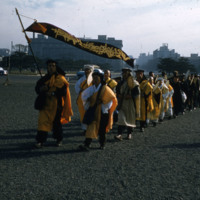 The lead marcher carries a penant, possibly with the Buddhist mantra "Namu Myōhō Renge Kyō" (Devotion to the Mystic Law of the Lotus Sutra). 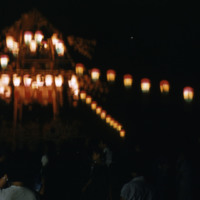 A blurry picture of glowing lanterns suspended over a crowd of people at night, possibly an Obon (festival of the dead, observed annually in August). This is the Mizuya, or water basin, in the first courtyard at Nikkō Tōshōgū. A group holding umbrellas stands at a hand-washing fountain at Nikkō Tōshōgū. 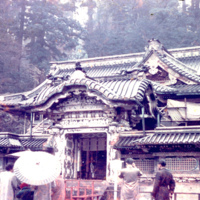 This photo of part of a building at Nikkō Tōshōgū shows the distinct style of the shrine (more can be seen on the Nikkō Tōshōgū page). 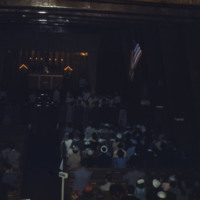 A dark photo of a church service indicates the presence of Christianity in Japan in the 1950s. Most large denominations are represented in Japan, including Catholicism, Protestantism, and Orthodox Christianity.